Heather's Tummy Tamers Peppermint Oil Capsules for IBS are an enteric-coated blend of peppermint, fennel, and ginger oils that soothe and relax the digestive tract. Peppermint, as part of the diet, helps relieve abdominal pain, diarrhea, and urgency from IBS. Menthol and methyl salicylate, the main active ingredients of peppermint, have calming effects on the stomach and intestinal tract. Although peppermint is such a powerful smooth muscle relaxant that it can trigger GERD (Gastroesophageal Reflux Disease) or heartburn in people who are susceptible, because Heather's Tummy Tamers Peppermint Oil Caps are enteric coated they do not dissolve in the stomach. Instead, they pass through the digestive tract intact until they reach the intestines. 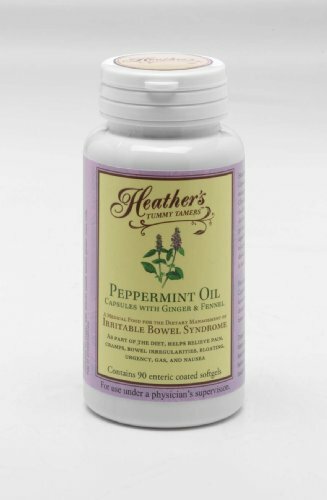 For this reason, Heather's Tummy Tamers Peppermint Oil Caps are often very helpful for people with both reflux and IBS who cannot tolerate peppermint in other forms (such as teas or foods). Fennel, as part of the diet, helps regulate contractions of the small intestine and aids gas expulsion. Fennel also relaxes the gut, which can relieve spasms of the GI tract. As a result, fennel assists in the dietary management of IBS gas, bloating, and abdominal pain. Fennel is exceptionally beneficial for bloating and gas. Ginger contains powerful digestive enzymes, and is helpful for a wide variety of gastrointestinal ailments. Heather's Tummy Tamers Peppermint Oil Capsules are considered a medical food for the dietary management of Irritable Bowel Syndrome symptoms, and they are specially formulated to address global IBS symptoms through the synergistic effects of peppermint, fennel, and ginger oils. This product is a medical food for the dietary management of Irritable Bowel Syndrome (IBS) symptoms and is intended to be used under a physician's supervision. Heather's Tummy Tamers Peppermint Oil Caps contain no FODMAPS, sugar, salt, yeast, wheat, gluten, corn, milk or preservatives. Peppermint oil capsules have been clinically proven to help IBS symptoms in both adults and children. Each capsule contains: 181 mg peppermint oil; 19 mg fennel oil; 17 mg ginger oil. If you have any questions about this product by Heather's Tummy Care, contact us by completing and submitting the form below. If you are looking for a specif part number, please include it with your message.